On June 16, to his surprise, Jay Cutler arrived at the L27 rooftop bar at The Westin Nashville for his own retirement party. Unbeknownst to Cutler, his wife, Kristin Cavallari, had invited several dozen family and friends to a celebration of his football career and a sendoff to his next pursuit, a broadcasting gig with FOX Sports. Overlooking Nashville’s highest infinity pool and a sweeping view of the city below them, guests including Miami Dolphins head coach Adam Gase listened to Cutler as he thanked all those who had a part in his life in the NFL. “I don’t know if I was convinced he was done,” says Gase, who coached Cutler as a coordinator in Chicago in 2015—arguably Cutler’s best season—before taking the head-coaching job in Miami in ’16. Fast-forward to August 3. Miami starting quarterback Ryan Tannehill suffers a season-ending ACL injury to the same knee that sidelined him last December. Gase reached out to the 34-year-old Cutler. By Gase’s recollection, the call was brief. Hey, you got any interest in coming? All right, I’ll get back to you. Cutler’s agent, Bus Cook, and Dolphins Executive Vice President Mike Tannenbaum worked out a one-year, $10 million deal to bring Cutler out of retirement. In the meantime, Gase asked his football team to trust him. Miami improved from 6-10 in 2015 to 10-6 and a playoff appearance in 2016, and was inserting a retired father of three coming off a torn labrum who hadn’t been a part of that turnaround, into the most important role on the team. How good Cutler can be with the normal season prep time halved is a matter of considerable speculation. Since he entered the league in 2006, only four quarterbacks with 50 or more starts have thrown interceptions at a higher rate: Vince Young, Mark Sanchez, Ryan Fitzpatrick and Josh Freeman. At his best, with Gase in 2015, he cracked a 90 passer rating for the first time and threw just 11 interceptions, his lowest total when starting at least 11 games in a season. The offense that year was a hodgepodge of vertical concepts borrowed from former mentor and boss Mike Martz, and quick throws native to the West Coast offense. According to those who have watched Cutler acclimate himself over the past 10 days, only the language has changed since he last played for Gase. During the transition, offensive lineman Jermon Bushrod became a resource for both Cutler and the players interested in learning more about their replacement QB. Bushrod had spent three seasons in Chicago with Cutler from 2013-15 and was happy to sing the praises of the Dolphins to the QB, and vice versa. “He was asking me how it was down here,” Bushrod says. “I told him we’re young but we’ve got guys who work, and do it everyday. Was he lazy, uncaring, or aloof, as the Smokin’ Jay Cutler meme suggests? “I know what everybody knows,” says cornerback Byron Maxwell, who had two interceptions and forced four fumbles in 2016, his first season in Miami. “Your first impression is what you see on TV—his teams didn’t win. That’s honestly how I judge quarterbacks. They’ve got the ball in their hand more than anybody, and his team didn’t win. 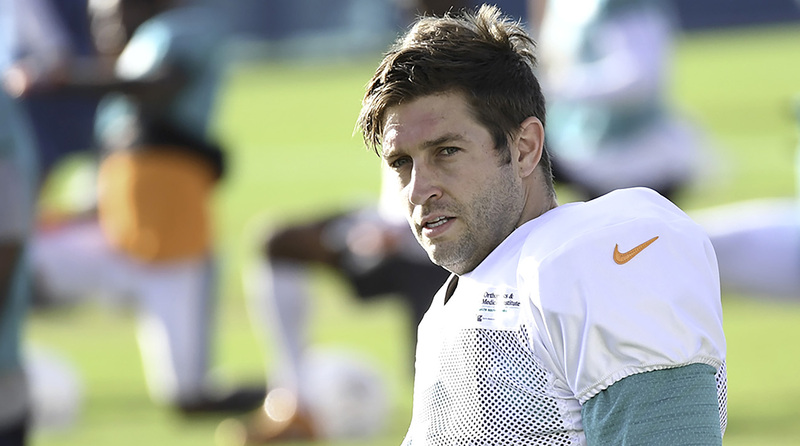 By the end of the first week, Cutler was taking first team reps with his new club, dropping dimes and ducks with equal frequency in the sweltering South Florida heat. During one 11-on-11 session last weekend, he tried to hit DeVante Parker on a fade-stop route in the end zone and instead found the waiting hands of Maxwell, who took the interception the distance, darting through the reserve linemen milling behind the offensive huddle. It’s a funny thing to watch a defense intercept a starting quarterback in training camp with a few hundred fans watching. There’s the initial jolt—the thrill of the ball going the other way—then there’s the sudden pall that accompanies the realization that starting quarterbacks shouldn’t be throwing interceptions against an absentee pass rush. Then there’s the muted applause for Maxwell, who did, after all, just make a fine play. “All I heard is cheers,” Maxwell says with a smile. “We were beating up on the offense. That happens in training camp, they have their days too. Today was our day. Creating an understanding of expectations between quarterback and receiver has been one of Cutler’s first priorities in camp as he prepares to potentially start his first preseason game Thursday against the Ravens. On their first day of practice together, Cutler and tight end Julius Thomas failed to connect on an out route, and Cutler was eager to give Thomas instruction. He wanted Thomas out of his break quicker, and for Thomas to get better outside leverage on the defensive back. Thomas, who joined the team this offseason, knows less of Cutler’s habits than several of his teammates, who spent last season in film rooms with Gase reviewing film on his previous quarterbacks, including Tim Tebow, Peyton Manning and Cutler. Gase used examples of successful plays from each quarterback while installing his playbook. One major thing Miami receivers noticed about Cutler from those sessions: He’ll chuck it up. “When you watch that film, you love the fact that he would put the ball up there and let the receivers make a play,” says Stills. “We’ve got guys in this offense who can make a play if given the chance. And with Jay it didn’t matter who his receivers were, he was going to give them chances to make plays. We want those opportunities. About 20 minutes after the Maxwell pick-six, Cutler saw Parker streaking down the left sideline in a two-minute scenario and threw at his inside shoulder, directly at second-year cornerback Xavien Howard’s head. But Parker swam over Howard's shoulders, veered in and caught the pass in stride for a touchdown. The crowd blew up for Cutler like they hadn’t for Maxwell. There’s still something salvageable here, maybe even something special.